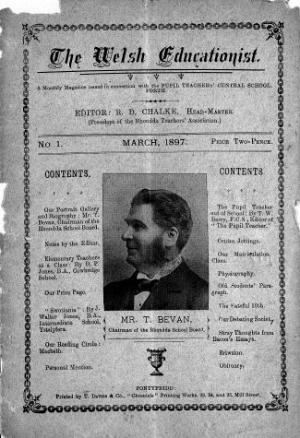 The monthly educational periodical of the Pupil Teachers' Central School, Porth. The periodical's main contents were articles on education and teaching, alongside news form the pupil teacher schools across Wales. The periodical's editor was R. Davis Chalke. Associated titles: The Welsh Pupil Teacher (1897). Publisher Details: T. Davies & Co.